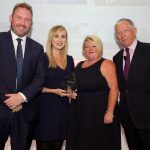 Recently Maxims were awarded the UKWA Training Award at the recent UKWA Lunch and Awards held in London. The UKWA, recognised Maxims commitment to training and the benefits it had brought to the company. In particular the long term development of apprentices into Line Managers was highlighted and the amount of former trainees working in the Traffic Office. Well done to all involved and we look forward to further success stories.